The fruit and vegetables lining the front of the grocers, Cruson, in Camberwell Church Street in London are tempting - but not massively consequential. Yet this is just a tiny tip of a multi-billion pound sector comparable in size to oil and gas or defence. At £38bn, the UK convenience store sector makes up one-fifth of the country's total grocery market. And as the supermarkets and High Street chains fight tooth and nail for market share, the convenience store sector is holding its own. 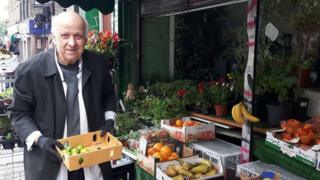 Aris, who runs Cruson, has been here since he left Cyprus in 1960. He won't tell me his other name and I am left wondering if it's his family name or first name. "It's Aris, just Aris. No one knows my other name." he says. "If you say it, you write it down, everyone will say, 'who is that man, I never heard of him'." He still speaks with a Cypriot accent, 58 years after he arrived in London. Aris wasn't always a shopkeeper. In the 1960s, he started by working in his cousin's Old Compton Street hairdressers cutting the hair of celebrities, including giving a shave to boxer Henry Cooper in 1963, the day after he had his face gashed open by Mohammed Ali. Camberwell has changed since Aris moved here in 1970. The first supermarket arrived in the 1980s and old family stores dropped away; a Tesco Express started up 400 yards away; and the early customers, the Cypriot and Jamaican communities, thinned out. But Cruson is still here, with its vegetables and fruit display edging out onto the pavement each morning. Since the Association of Convenience Stores (ACS) started surveying local stores in 2012 the sector has grown every year, despite supermarket competition, names vanishing from the High Street and customers increasingly going online. It is also remarkably financially self-sufficient. These shops don't have much time for banks and almost three-quarters fund investments from their own pockets - last year that came to over £800m. A slight frisson did run through the sector last year when Co-op bought convenience store chain Nisa and wholesaler Booker was bought by Tesco. Yet the effect seems muted so far. Chris Noice, ACS head of communications, says: "Those take-overs have may have changed things on the wholesale end, but it's not clear yet - it's very much a work in process. "It may well bring down wholesale prices which would be good for the whole retail industry." The big supermarkets have tried to make inroads into this market with the likes of Sainsbury Local and Tesco Express, but so far they make up roughly 1,500 of the UK's 50,000 convenience stores. Even chains such as Costcutter, Nisa, Spar or McColls, account for less than a quarter of the total. The remaining 75% are still in the hands of independents like Aris. And they have another key advantage over the big players - about three-quarters of them own their own leases or freeholds. All convenience stores, big and small, have to pay rates, but as Mr Noice points out, the independents are light on their feet: "They are very good and adaptable at keeping their costs down. "Tesco's business model means that a store manager will have data from Tesco Club Cards to guide him, but he or she can't react fast to demand. A small independent will react to his customer more by feel - if they see something is needed they'll do it." The result can seem to be something of an anomaly. Aris' fruit and veg displays are the only ones to be seen on Church Street. He admits ruefully the market isn't what it was: "Nowadays the young people don't cook. It's a pizza, it's a kebab, if you show them vegetables they don't know what to do with them." Even so, he's not short of loyal customers for his taramasalata or lugging in his watermelons up to the till. He's one of the few retailers to stock ugli fruit - a wrinkled Jamaican orange-tangerine-grapefruit hybrid - and he does a good line in tomato plants and herbs for locals wanting something green to perch on a windowsill or trail across an urban trellis. Don't let anyone tell you it's an easy life. Aris seldom gets to bed before 11pm and three days a week he is up at 3.30 am to get to the market. On average a convenience store is open more than 14 hours a day, and a fifth of storekeepers take no annual holiday. John Augustine has a different story altogether. A former marketing manager for southern India for the American wines and spirits business Brown Foreman, he came to the UK 17 years ago. Now with his business partner Renchu Sachivothaman, he owns Matt's Food Wine and More in the village of Barrow in west Suffolk and has another store in Ipswich. "It was simple really. I just didn't want to work for anyone else any more. I wanted to be my own boss," he says. He has ambitions beyond retail, with an eye to buying property and branching into healthcare once he can build up enough capital. The store is polished and professional, managed by Lee Button, a former Shell manager who lives in Barrow. Part of the reason stores like this exist is the sparsity of rural shops. Some 40% of convenience stores are in isolated areas. In Barrow there is competition a few yards down the road - the Barrow Convenience Store, part of the Premier chain. But the village is growing fast. There's a new housing estate half a mile away and Mr Augustine says there is room for them both. "If we had to rely on just Barrow the two of us wouldn't be able to survive, but there are five of six other villages around which have no shop at all, and who depend on us, and there is passing traffic too southwards from the A14," he says. As for online shopping, the convenience stores are playing an unexpected trump card says Mr Noise: "The competition from online can actually work to their advantage because they can serve as a pick-up and drop-off point. "It is that last mile that the online delivery services really struggle with, and convenience stores can play an important role in getting stuff to customers." Matt's Food Wine and More serves as a collection point for MyHermes parcels which has about fifty regular users. The store also has a Facebook page. Manager Lee Button says: "It's used by people in the villages who normally wouldn't drop in. But this way they find out about what we do online or whether we have something in stock." The convenience store serves one other unexpected role: an engine of social mobility. According to ACS, only a quarter of the stores are inherited. The children of convenience store owners, it seems, move onwards and upwards. Mr Augustine bought his Barrow business from Yogi Patel who still lives in the village, but who ran a total of 19 convenience stores. Mr Patel's son works for Citibank. As one generation steps down there is no shortage of newcomers wanting to take over. Aris, standing among his fruit and veg, is philosophical: "There will be someone else to take my place eventually. They will be Indian or Vietnamese, someone new. There is always going to be a shop here." As for Aris' son, he has no interest in taking on the Cruson store. He works round the corner. He is a dentist at King's College hospital.